The touchscreen keyboard on the iPad is a very tough act to follow. Many companies have tried with Bluetooth keyboards and ended up with nothing to offer consumers that’s superior to the original touchscreen. 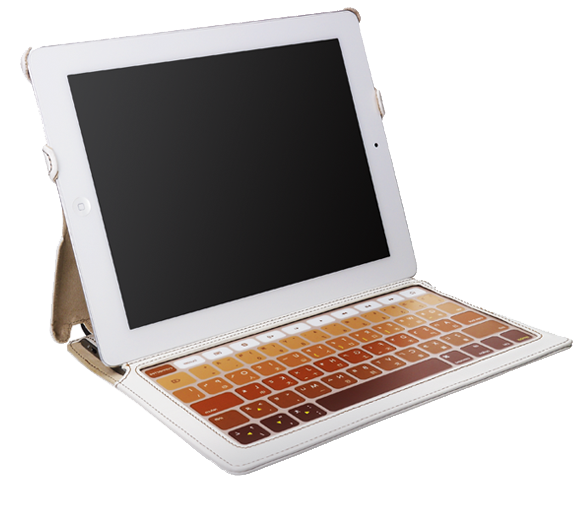 One of the newer entries into this field, Hatch & Co.’s Skinny Keyboard Case for iPad 2, comes closer to real functionality than similar products I’ve used lately. The Skinny Case, as its name suggests, is not just a Bluetooth keyboard, but also a case or folio. The iPad 2 slips into the top half of the leatherette case. When closed it’s a thin portfolio; when open your iPad is in front of you, nearly perpendicular to the compact keyboard. Not much revolutionary in that, but the keyboard is another story entirely. It does not feel at all like a keyboard and requires a very light touch. The “keys” are flat Chicklet-sized touch pads, not much different than those you’ll find on an ATM or, for that matter, on your iPad itself. But the Skinny’s key, are smaller than the keys on the iPad screen. I hesitate to call this a keyboard because that conjures up something that feels completely different from the Skinny. When you run your fingers over these keys, you can barely feel the bumps. The keypad is so discreet that Skinny included a nice feature, a key called the Buzzer. Press the Buzzer key and when you type you’ll hear a click for each letter. This is a clever little trick that lets your brain think you’re typing on something other than an electronic keyboard. You can turn the sound on or off by pressing the button but I found it strange to type with no audible feedback whatsoever. When the key is clicked, I felt like I had a better handle on what I was doing, and yet I know it was just an illusion. One of the Skinny’s features is a Symbol key. If you want to move around your document with the up, down, right, and left arrow keys, you touch the Symbol key once and off you go. It’s a toggle switch so when you want to use the key to insert a symbol, you merely touch it once more and its navigation prowess disappears. On the iPad’s touchscreen, you can only navigate by pressing your finger on the screen and dragging the cursor where you want to make a change. There are no arrow keys. I found the Skinny’s arrow keys much easier to use. Some Bluetooth keyboards are still only powered by AAA batteries. Others, including the Skinny, enable you to recharge the unit by plugging it into any powered USB port. Pairing the Skinny was simple, and you only have to do it once in your iPad’s Settings. The manufacturer says Skinny’s battery will last two weeks, or six weeks on standby. I haven’t had it long enough to verify that information. When the battery is running low, a light at the type of the keyboard flashes slowly, a nice touch. There’s even a Caps Lock light. When the case is closed, it puts the iPad into sleep mode after 10 seconds. It’s clear that designers put a lot of thought into this device but it’s certainly not going to appeal to everyone. If you’re used to pounding on your keyboard keys as though you’re still using an ancient Underwood typewriter, you’re going to have to turn into an 80-pound ballet dancer to get comfortable with this keyboard. On the other hand, with a little training, you can be doing your demi-pliés across the keys inside of a week. And for those who suffer from arthritis or any other weakness in the hands, this keyboard can be a real asset.